Jared’s moustache, Harry, was keeping a journal for most of Movember. 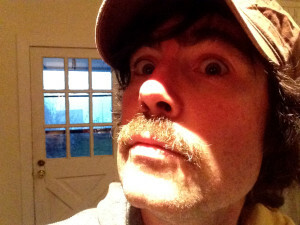 You can see his entries here, here, here, here, and on Jared’s Movember page. Sorry that Harry and I didn’t post more during the last week. We were moving to a new place and things were a little hectic. Harry was a trooper though and kept on growing the whole time. But really, it is. I miss my cozy follicles — but I’m really happy that I got to help spread the word and raise money for Movember this year! Thanks to everyone who donated (including Valli, Tori and Laila in the last week or so) and gave encouragement. Harry and I met met our extended fundraising goal of $300 thanks to all of you! Hopefully Harry and his moustache brethren also gave you an opportunity to talk about men’s health issues, too. Guys don’t always like talking about prostates, testicles, or mental health problems… but it’s important that we do! Thanks again! Harry’s gone back into hiding, but he’s always close by if you need a mo to talk to.